I am a native Coloradoan that found my passion for nature at an early age thanks to beautiful spots like this. 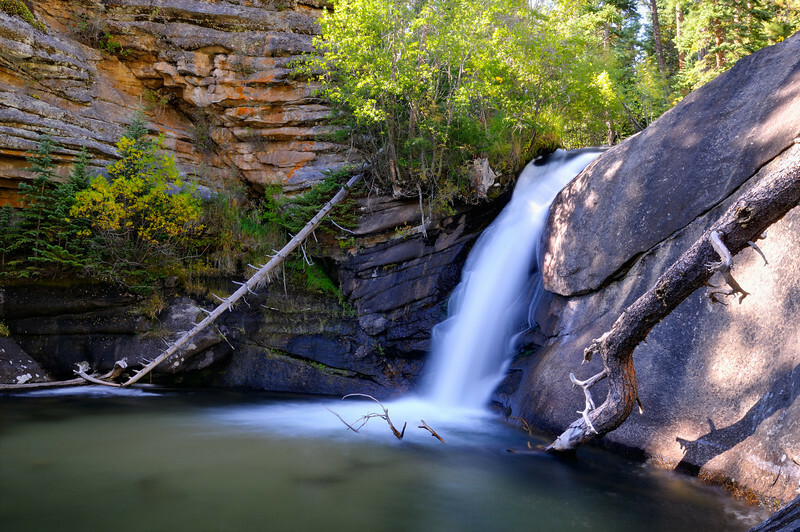 West Creek Falls are just inside Rocky Mountain National Park and also are within the West Creek State Natural Area. West Creek below the falls serves as habitat for populations of the threatened native greenback cutthroat trout (Onorhychus clarki stomias). Image note: a couple of folks in the comments have asked if this is an HDR. I would say 20% or less of what you see here is HDR and 80% is basically an unretouched original as the base image. I often find laying an HDR image that is as good as I can get it on the non-hdr middle ev frame and then turning the opacity down on the HDR layer can help keep colors natural and yet still protect highlights and bring out shade details. Also for the HDR software used on this, it was actually the new Photomatix beta 3.1 version's exposure blending with all the manual controls (try it!) and no tone-mapping was done.